The Trust has become the first in the country to join the FROSTTIE clinical trial to help babies with breastfeeding difficulties. Up to 11% of newborn babies can have tongue-tie, which can affect their ability to breastfeed. Staff at the NNUH have enrolled the first five babies to the national trial, which aims to find out if skilled support for breastfeeding on its own, or together with a minor snip (frenotomy), helps mothers and their babies to breastfeed. The trial, which aims to recruit 870 patients, is being coordinated by the University of Oxford and has been funded by the National Institute for Health Research (NIHR). The study is supported locally by NNUH Clinical research and Trial Unit. Luisa Lyons, Specialist Midwife for Restrictive Lingual Frenulum and Lactation Support at the NNUH, said she hoped the study will eventually lead to more support for babies with breastfeeding difficulties. “We are the first in the country to get started on this important study and it is prestigious for the hospital. We want to be leading this study in the UK if this is the biggest research to date on tongue-tie. We feel that our service at NNUH is really good and we follow-up with our mothers and babies to see how they are doing. Our results from hundreds of mothers show that 80% of parents report good or excellent improvement in feeding after frenotomy. An additional 10-15% report a mild improvement. We have subsequently seen improvements in the number of women breastfeeding. We know need to know if this is all due to the surgical procedure or if it could be due to placebo effect and the additional breastfeeding support,” she said. Breastfed babies aged less than 10 weeks with a diagnosis of tongue-tie are eligible for inclusion on the FROSTTIE study, as long as the parents are willing to enter the trial and have the decision about frenotomy decided randomly. All babies will continue to receive breastfeeding support. A frenotomy involves cutting the short, tight piece of skin connecting the underside of the tongue to the floor of the mouth and is a quick procedure that can be carried out during an outpatient appointment. The tongue-tie service at the NNUH was established by Consultant Paediatric and Neonatal Surgeon Mr Ashish Minocha in 2006 with administrative and logistic input from Penny Slaughter, Paediatric surgical secretary. Last year more than 1,800 babies were seen at the Restrictive Lingual Frenulum clinic. The team has since expanded with appointments of Specialist Midwife Luisa Lyons, and RLF coordinators Sara Callam and Jessica Halls. The service has been well supported by Mr K Mansoor, Miss S Singh, Mr S Mansour & Mr S Kisku, and all Paediatric Surgical Consultants who have contributed significantly to its success. 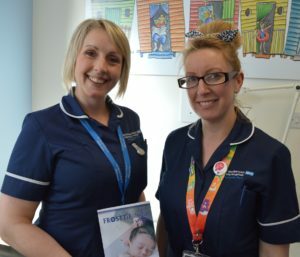 The maternity team at NNUH are proud to be accredited with the prestigious UNICEF (United Nations Children’s Fund) Baby Friendly Initiative (BFI) Award.